Both the interior and exterior components of the Sisters' Camp is visible here. Perhaps one of the hardest things to do as a capsuleer is to keep ourselves grounded. Though this is certainly true in the physical context, I’m speaking today of the more metaphorical context. It is so incredibly easy to forget about the civilian community. The non-capsuleers, the general public, the unwashed masses, ordinary people, whatever you want to call them. I’ve heard fellow capsuleers praise them, patronize them, disdain them, and even insult them, but by far the most common reaction to the non-capsuleer public is perhaps the most destructive of all: we ignore them. It’s not hard to do it, heavens know I’ve been guilty of this myself. We get our missions, or we do our probing, and we want our isk. And no one can stand in our way when there is isk to be had. We capsuleers can conquer the stars themselves, a few non-capsule cruisers and battleships aren’t going to stand in our way. 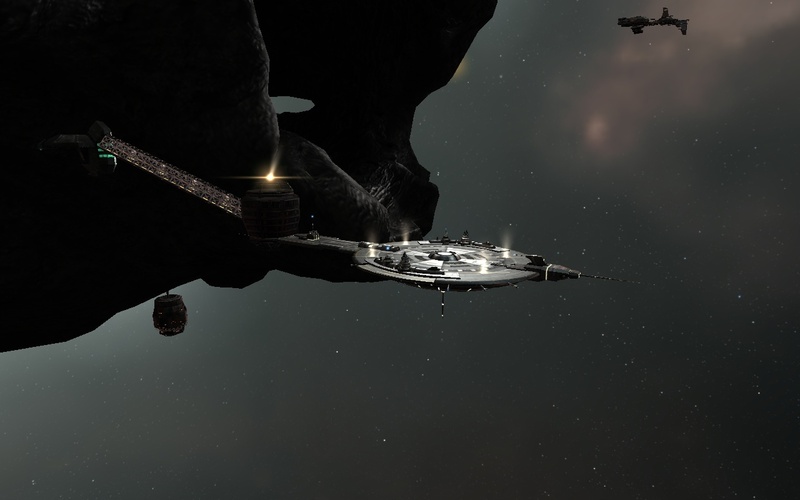 A view of the main landing pad for the station, and one of the ships that stands guard over the refugee center. Yet what is easy to forget is that every time we swat these small flies aside, people die. Depending on the ship upwards of a thousand people could be on every non-pod ship that we engage, and it’s almost impossible to to tell how many make it out alive, left to drift in the wreckage as us capsuleers move on to our next victims. There have been any number of times where even I can kill ships in just one shot, giving crews almost no time to react. Most people who volunteer to serve on these ships know what they’re getting into, and know what the survival rates look like. But intellectually knowing something is one thing, emotionally and viscerally knowing that you may only have a survival rate of less than 5%… that’s another matter entirely. Even beyond the direct affect we have on non-capsuleers who fly on ships, our actions can affect the lives of billions, be it through fighting for control of solar systems or just being on a rather unlucky cruise liner that gets caught in the line of fire. Indeed, it’s no surprise that most non-capsuleers view us with suspicion, and even fear, even when we’re acting with the best of intentions. This is one of just many reasons that we, as capsuleers, need to ground ourselves now and then. Remind ourselves of our humanity, whatever that means. One of the surveillance stations to keep an eye on surrounding space. 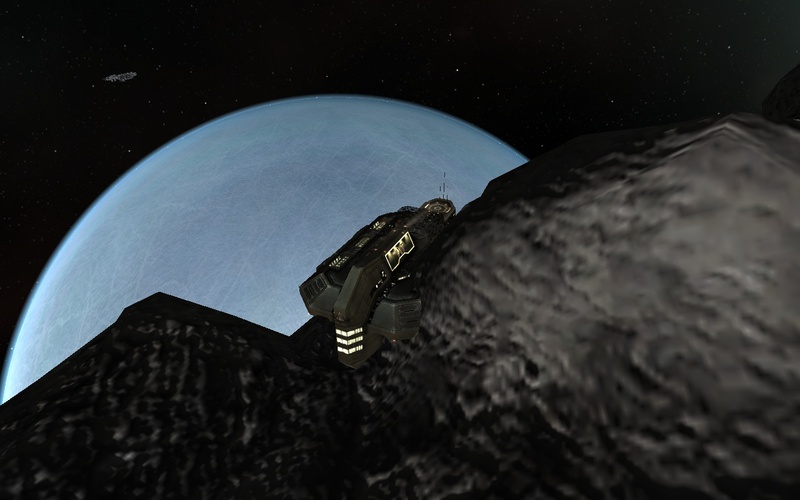 Legacy can be seen in the background, in orbit of Traun X. The Sisters of EVE, always ready to aid those in need, have set up a relief camp here. The constant skirmishes around the system leave many wounded and hurt. Many more have also lost all their assets after accidentally getting in the cross-fire or being beset by on of the many warring factions. Here, the Sisters are giving first aid to those that need it. They are also monitoring the conflict, checking for any signs of inhuman treatment or war crimes taking place. But as everywhere else, they strive to maintain their neutrality. A camera drone peers over the edge of the local police station, keeping order within the refugee center. Though some have questioned the Sisters’ intent and motive, I can’t fault them for their results. And they seem to be holding not just the pirates, but also the factions, to account to prevent atrocities. I know some would argue that all war is an atrocity, but unfortunately war is an inevitable part of human nature; the best we can hope for is to limit its effects to those who are directly involved in the fighting in some way. The Sisters appear to be trying to do just that. By monitoring the state of warfare throughout the constellation, they can have direct evidence if one side or another begins to use inhumane means to achieve their ends. By keeping themselves fastidiously neutral, they can leverage their reputation without worries that they are working for one side or another, instead of seeing to what really matters: care for those who are caught in the crossfire. The infrastructure the Sisters had managed to build up in Traun was impressive. It was a rather sprawling site, much more than I was expecting. The site itself was built around a hollowed-out asteroid. 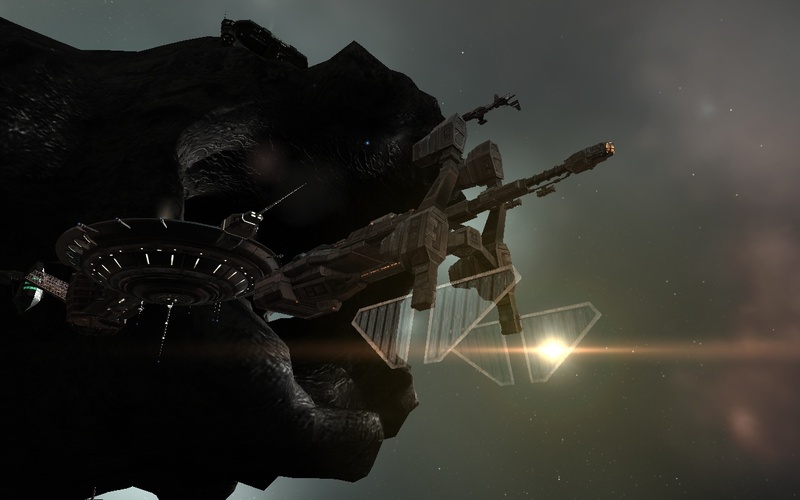 The massive rock provided a solid foundation for the base’s infrastructure as well as protection should anyone attempt to test the Sisters’ resolve in the constellation. 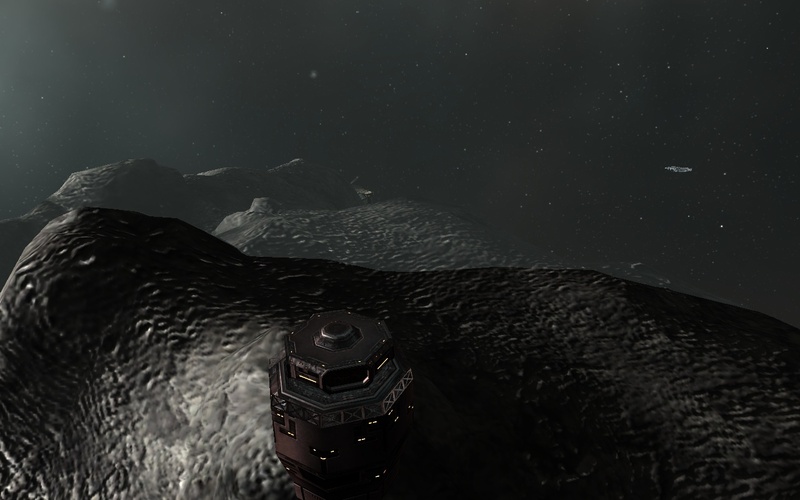 Only a few buildings were viewable from outside the asteroid: the main landing pad and a few surveillance stations. 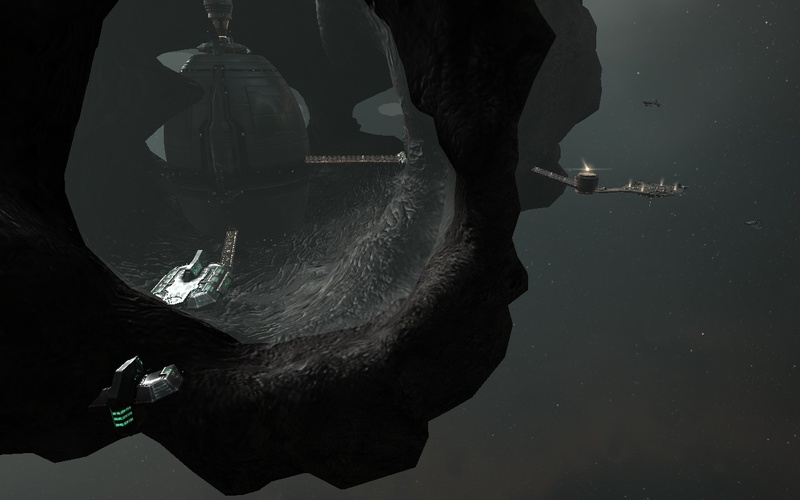 The stations had a commanding view surrounding the asteroid, and provided them with a centralized location to monitor all the events in and around Ani. The asteroid itself had two openings roughly 180 degrees apart from each other. 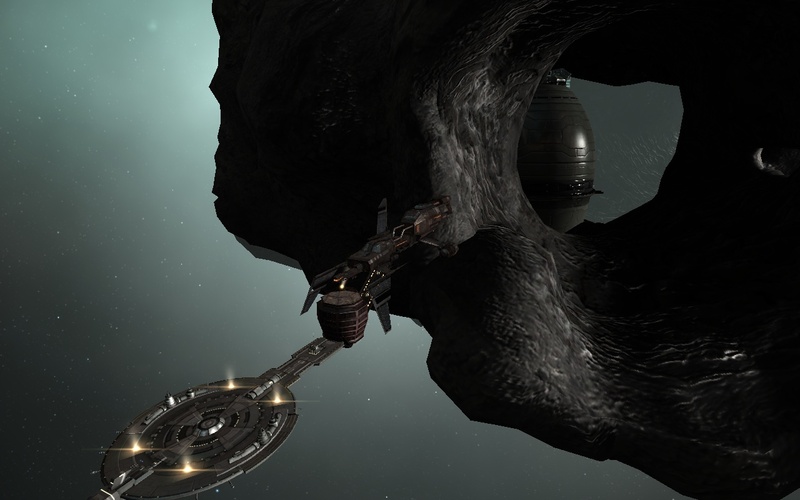 These two rather gaping holes, at least three times as big as my Drake, allowed access to the main facility, and the ability for me to see inside. Inside was a bit more crowded. The vast majority of the refugees made their living in a converted storage silo. Given the sheer volume of the silo, this makes sense, it could probably house thousands with room to spare. A number of surrounding facilities were built into the rock walls, providing logistical support. 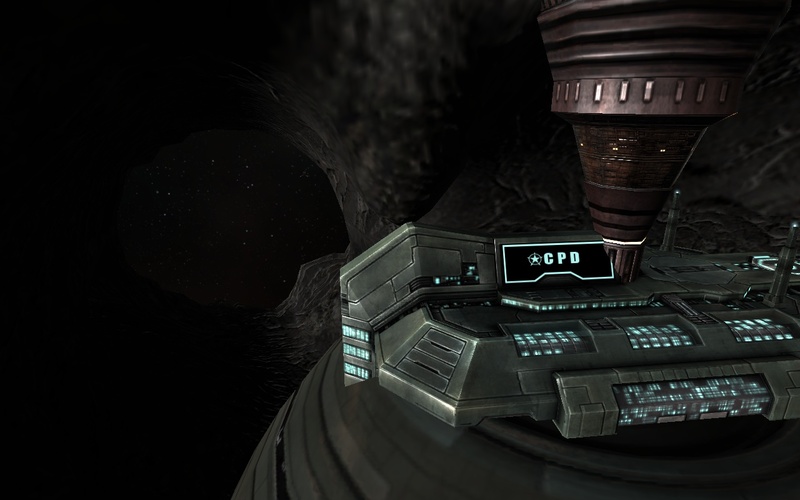 CONCORD has even made a point of showing the banner here; they have set up a station to act as police for the Sisters, helping them keep control over what at times must be a restless population. Sunlight filters in through a nearby ship's sails, stationed near the center's landing pad. It seemed to be a fairly basic base, but it certainly got the job done. I would expect nothing less from the Sisters. But what it lacked in amenities, it made up in the most important way of all: it gave the refugees a home, if only temporarily. Losing everything and being forced to flee your home is a terrifying ordeal, but knowing that there is someone out there that will take you mean can make all the difference in the world. That sort of terror is something that is completely foreign to us pod pilots. We have enough money to buy almost anything our heart desires. We can find free shelter at any one of literally thousands of stations who are eager to house us in the hopes of getting even our trash. We have no need to fear death, since clones provide us with a nearly flawless new body whenever needed. In many respects, I suspect that we’ve forgotten what it is to be human. The very thing that has let us leave the surly bounds of our planet and touche the sky has also, fittingly, kept us from grounding ourselves in our own humanity. Scheduling Note: This coming Thursday is Thanksgiving in the United States. Since I will be up to my neck in family festivities, I don’t think I’ll be able to update next week. Sorry! This entry was posted on November 20, 2011 by mark726. It was filed under Hi Sec Sights and was tagged with metropolis.